Here's ukulele fun for the whole family! 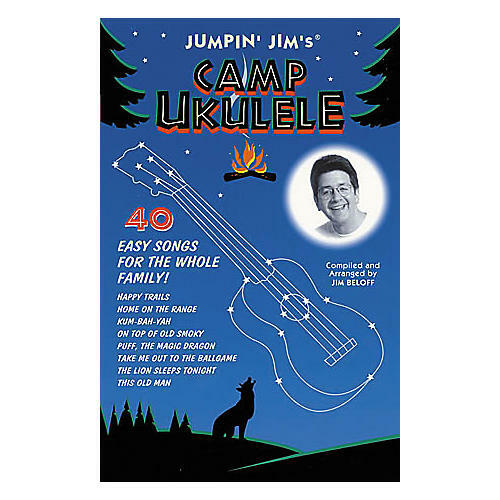 Jumpin' Jim's Camp Ukulele is a collection of 40 of some of the best-loved family sing-along songs with easy-to-play ukulele arrangements. Tunes include: Clementine; Go Down, Moses; Happy Trails; Home on the Range; The Lion Sleeps Tonight; The Sloop John B.; Take Me Out to the Ballgame; This Land Is Your Land; Waltzing Matilda; You Are My Sunshine; and many others. This songbook features many vintage summer fun photographs, a chord chart, and a basic how-to-play section.